We have been serving collectors since 1982. We have a spotless record for integrity and service. We are always interested in buying quality collections. Off-white pages. Book is printed a bit sideways, trim is off. 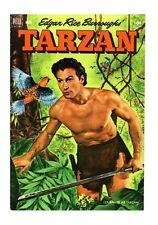 Tarzan #60. 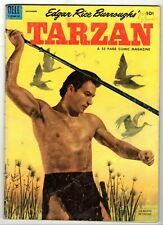 This 1954 issue of Dell Comics, Tarzan #60 is in Very Good Condition! 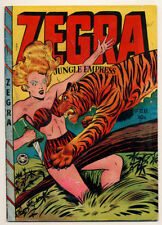 Cover and most of contents from Jungle Comics #109. Comic is slightly shorter. In color, and on better paper. Sorry, USA only, no exceptions. We have been serving collectors since 1982. We have a spotless record for integrity and service. Inside cover are blank. Sorry, USA only, no exceptions. We have been serving collectors since 1982. We have a spotless record for integrity and service. We are always interested in buying quality collections. Painted cover by Norman Saunders. "The Dry Grip of Doom" starring Wild Boy, Keeto, and Chief Taaba; Animals and natives are looking for water. "The White Robe of Courage," art by Gerald McCann; The chief's White Robe of Courage has been handed down from father to son, but chief Jaru's son show no courage to wear it. Nice hard to find first issue Tangi begins, comic is in nice condition with all pages attached. There is a small bug chew on the bottom right as seen in the pictures. 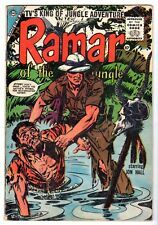 JUNGLE #100, FICTION HOUSE, APRIL 1948 GREAT GG ART. NICE PAGES. We have been serving collectors since 1982. We have a spotless record for integrity and service. We are always interested in buying quality collections. Sorry, USA only, no exceptions. Lee's Comics. Comic is in very good, creasing, small tears, off-white pages. Sorry, USA only, no exceptions. We have been serving collectors since 1982. We have a spotless record for integrity and service. We are always interested in buying quality collections. Off-white pages. 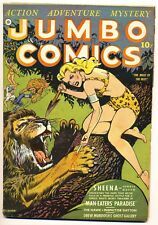 He has over 17,000 comic books of many different titles and conditions from the mid 1930’s through the 1990's. Most are raw but there are a few that have been professionally graded. I do know that his earliest book is New Fun # 2 from 1935 and goes up as recent as Todd McFarlane’s Amazing Spiderman issues. Art by Bob Powell. Cover by Bob Powell. The Axe of Death! ; The Dragon Devil! ; The Terror of the Witch Doctor! ; Cave Girl: The Man Who Served Death! 32 pages, Full Color. Published 1952 by Magazine Enterprises. For your protection, this comic has been slabbed and graded by the CGC experts in Florida -- universal slab in 4.0 grade VG. I bought the comic already slabbed, so I have no knowledge of the book's interior. "Orphans of the Congo," art by Maurice Whitman; Kaänga, Ann, and Zulu rescue the kidnapped parents of a pair of lost white children. Untitled story, art by Henry Kiefer; Wambi grows bored with Tawn and Ogg and goes to play with the monkeys; He builds a kite and his pulled off his feet into a crocodile pool; His cries for help reach the ears of Tawn and Ogg who rescue him and chide him for playing with monkeys. Art by Wally Wood and others. 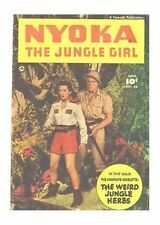 The Spoor of the Elephant Rustlers; Gentleman of the Jungle; Making of a Killer; The Two Headed Fly of the Jungle; Tiger Plague of N'Gessa. 32 pages, Full Color. Published 1950 by Fox Feature Syndicate. Cover by Wally Wood. 32 pages, Full Color. Published 1950 by Fox Feature Syndicate. Grade: VG 4.0. This is a low grade item. It will be complete and readable, but will show significant wear. Cover art by John Celardo. Untitled story, art by John Celardo; The overseers of the Hamiltons' mine discover that a vein previously thought to be worked out still has yields; They plot to kill the Hamiltons and claim the mine for themselves. Published 1952 by Fiction House. of comics, generally about 25-40 comics depending on page count. Untitled story; Trader Dawson explains the magic bound up in a peculiarly-shaped rhinoceros horn that a representative of the British Museum wishes to buy. Published 1951 by Fiction House. Grade: VG 4.0. This is a low grade item. It will be complete and readable, but will show significant wear. of comics, generally about 25-40 comics depending on page count. 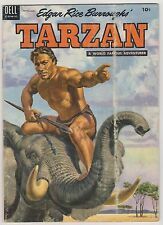 Published 1947 by Fawcett. Grade: VG 4.0. This is a low grade item. It will be complete and readable, but will show significant wear. "The Witch Doctor's Madness!". Lion-Hearted Leo back-up story, "The Bear Hunt.". 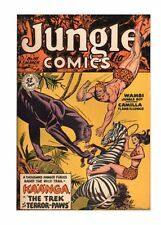 JUNGLE TALES 4 VG/4.0 - Jann of the Jungle in "Fanged Fury!"